The “duty to defend” is commonly understood to be central to the role of the state attorney general, but this duty is also one that serves the General Assembly. Without an institution that is charged with enforcing and defending the state’s laws, the work of the state legislature could be ignored and thereby rendered ineffectual. The Attorney General (AG) ensures that the laws that the General Assembly labors to produce each session have an effect on the lives of Coloradans. Created by the Colorado Constitution, the office of Attorney General, housed in the Department of Law, is technically an executive branch agency. However, the AG’s Office in Colorado is headed by an independently elected attorney general who can serve a maximum of two four-year terms. The Colorado AG is charged with serving as the legal counsel for every department or division of the state and representing the state in any action in which the state is a party or is interested, with few exceptions. The Attorney General does not represent the legislative branch, though the General Assembly may request a formal attorney general opinion from the AG on questions of law. In terms of specific powers, the Colorado Supreme Court has held that the Attorney General gets his or her authority from two places: the common law—unless the General Assembly specifically repeals these powers—and statute. It is also worth noting that as an independently elected official, the AG does not report to the Governor. The AG represents the state, a position that was reinforced by the Colorado Supreme Court recently when Governor Hickenlooper tried to block Attorney General Cynthia Coffman from suing the federal government over the Clean Power Plan. The court declined to issue an opinion on the matter, stating that there were alternative remedies available. Although the AG’s office may represent the Governor in some capacities and may issue legal opinions to the Governor, litigation control rests with the AG, and the Governor may not direct the AG to cease litigation. In certain circumstances, the Governor or other state agencies can employ outside legal counsel should the AG be unable to provide the legal services needed. In practice, the two offices may confer on major issues, but there is no obligation to cooperate. Business and Licensing: This section represents the Department of Regulatory Agencies and many of its divisions, the Department of Agriculture, the State Personnel Board, the Independent Ethics Commission, the Mined Land Reclamation Board, the State Claims Board, and the Office of the Child Protection Ombudsman. Revenue and Utilities: This section represents the Department of Revenue, the Trial Staff of the Public Utilities Commission, the Property Tax Administrator and Property Tax Division, and statewide clients regarding bankruptcy matters. State Services: This section represents half of the executive branch state agencies in Colorado (including the Department of Labor, Department of Education, Department of Higher Education, and the Colorado Department of Health Care Policy and Financing), as well as Colorado’s five elected public officials: the Governor, Lt. Governor, Attorney General, Secretary of State, and Treasurer. Consumer Protection: This section represents Colorado consumers by prosecuting fraud; enforcing consumer protection and antitrust laws; implementing the Tobacco Master Settlement Agreement; enforcing state laws on consumer lending, predatory lending, debt collection, rent-to-own, debt management, and credit repair; and advocating for residential, small business, and agricultural public utility ratepayers through the Office of Consumer Counsel. Criminal Justice: This section provides assistance to district attorneys in certain types of cases and prosecutes multi-jurisdictional cases involving human trafficking, major drug trafficking organizations, and white-collar and environmental crimes. This section also prosecutes crimes in which the AG has original jurisdiction: securities, insurance, and election fraud. Criminal Appeals: This section is responsible for all Colorado criminal prosecutions at the appellate level. Natural Resources and Environment: This section represents the Colorado Department of Natural Resources and the Colorado Department of Public Health and Environment and advocates on behalf of the Colorado Resources Trustees and the Colorado Energy Office. Civil Litigation and Employment: This section defends all state agencies and employees that are sued in state or federal court for personal injuries, property damage, employment discrimination, or constitutional violations. 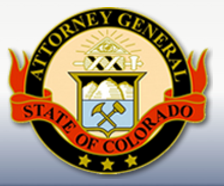 This section also serves as general counsel to a host of agencies, including the Colorado Department of Transportation, Department of Corrections, State Board of Parole, POST Board, and Civil Rights Division. The AG’s Office also houses the Office of Community Engagement, an office dedicated to informing the public about the work of the AG’s Office and engaging citizens in dialogue about solutions to social issues within the purview of the office. This office also houses the Safe2Tell program, which provides an avenue for a student, parent, school staff, or concerned community member to anonymously make a report if he or she believes there may be a safety threat. The Department of Law, which employs about 270 attorneys, is the largest law firm in the state of Colorado, but its size matches its charge. It is responsible for representing almost every arm of state government and defending all of the state’s laws. This massive task is led by an independently elected attorney general whose duty is to the state, its laws, and its citizens. Though the AG’s office does not legally represent the General Assembly, the AG’s responsibility as the state’s chief law enforcement officer establishes an important relationship between the two government entities.